Matt's robotics team went down to Peoria for a district competition, made it to finals, lost in finals, but received the Chairman's award for being a model robotics team. Some of the robotics team member families decided to welcome home our little robot people with signs and balloons to celebrate the award and the qualification for World's competition in St. Louis in late April. It has taken me 4 years to understand how the competition system works (and there are parts I still don't understand), but Matt understands it, and can expound at length. He wore his two medals to school today (one for team finalist in the regional competition, and one for Chairman's award). I could tell he wore them because I heard them clinking as he walked in the door. At some point I'll get an actual photo of the robot, Sir Bedivere. Jim and I are planning on going to the competition in Minneapolis at the U in early April. I'll be able to see the robot in action. And the one where we finally return Mr. H's house key to him. We've had this house key for two plus years, ever since Hayley dog-sat for Mr. H. (Mr. H is one of the district band leaders and he's familiar with the 4 band kids we've had). Hayley used to babysit Mr. H's daughters too. We are down to 1 actual band concert and 1 possible marching band event ever as high school band parents. Katie picked up a flute after fourth grade and we've been band parents ever since. One of the songs the Wind Ensemble played was Xerxes and if I may direct your attention to this post from six years ago, you will understand why I was so excited to hear it again. 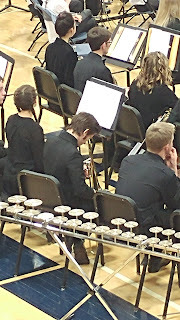 Also if you go back to that old post, you'll see Matt as a young trombonist. Too bad he wouldn't allow close up pics at this concert so you could gauge his growth. 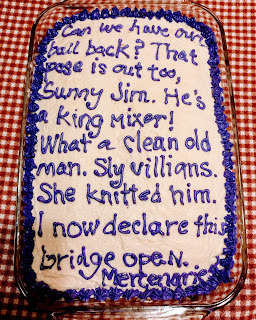 The title of a familiar song to Jim and me, which I did not use on Jim's birthday cake. I'm kinda done doing all out, fancy schmancy, detailed cakes anyway since I've done them for so long. I think the first one was a Batman cake for Paul when he was 3 or 4. And now he's in his 20s. But now that I think of it, I do have one more detailed cake to do: Matt's grad cake. Oh and Hayley's wedding cake(s). I went easy on myself for Jim's cake. Boxed mix, which I like better than homemade anyway, and Katie had given us some leftover buttercream frosting, enough to frost a cake and do minimal decorations on it. So when I sat down to decorate Jim's cake, I had to come up with an idea that was 1)easy, 2)special for Jim, 3)doable in one color because I wasn't going to mess around with multiple colors, and 4)no fondant.